It started with the avocado incident; slicing open my own finger is always* laugh-worthy to me. 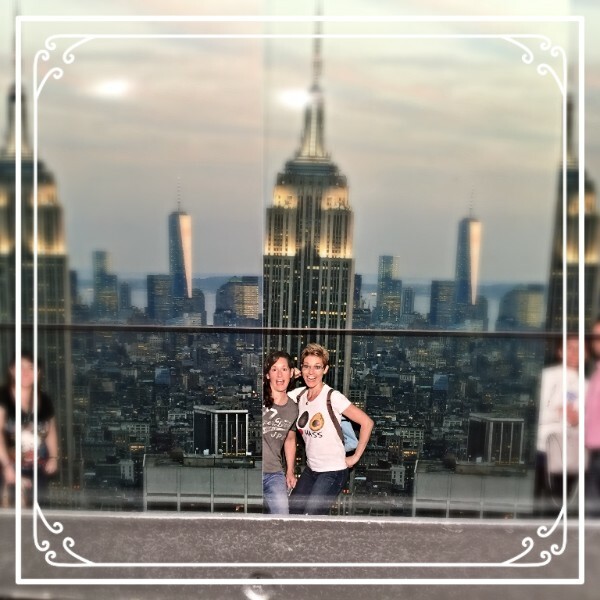 But it wasn’t until right after we two friends posed for the above super-imposed shot “in front of” the Empire State Building that I noticed it: a spray of blood just below the words, “I ❤ Hass” on my white t-shirt. Oh, how we laughed and laughed and waited in line to distract the sales rep while we took this contraband image of our own picture. New York City never looked so funny to me as it did that night from the top of it all. When you find yourself at the bottom of your emotional ladder you might feel sad, frustrated, angry, lonely, resentful, hurt, overwhelmed, or judgmental. Fast track yourself toward the top of your emotional ladder by laughing. Laugh intentionally. And laugh quickly. Find something that is guaranteed to put a smile on your face and do it immediately. Dramatic readings by the Muppets — what’s not to love about the Muppets? Reading my own Happy List — I keep a written daily record of things that make me laugh, smile, and that cause joy, and I’ve been tracking this for decades now. Take some time right now to jot down your known methods for inducing laughter, and the next time you find yourself down, go straight to your list to get yourself back up. If we’re going to laugh about it later, we might as well laugh about it now. — Dr. Mary Hulnick, Ph.D.
*Don’t worry; I have many stories I won’t be sharing with you in this forum.